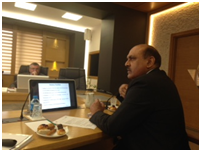 Prof. Dr. Muhammad Ashraf, Chairman PSF and Dr. Mirza Habib Ali, Focal Person of PSF for International Linkages visited Turkey for participation in the “IOSTE Eurasia Regional Symposium & Brokerage Event Horizon 2020”. 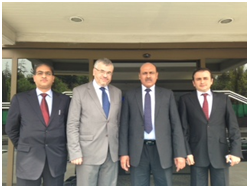 They also visited the Scientific and Technological Research Council of Turkey (TÜBİTAK), Ankara, on April 28. They held a meeting with Dr. Orkun Hasekioglu, Vice President of TUBITAK and Harkan Karatas, Director International Cooperation, TUBITAK. Both the sides briefed each other about the programs of their respective organizations and thoroughly discussed various areas of collaboration. It was mutually agreed that a Joint Committee comprising six members (three members each from Pakistan and Turkey) will be formed for implementation of the MoU between PSF and TUBITAK. The formation of Joint Committee is also part of the MoU as mentioned in Article 5. PSF and TÜBİTAK signed a MoU on 17th of September, 2013 at Ankara, Turkey to strengthen scientific and technological co-operation between Pakistan and Turkey on the basis of equality and mutual benefit. The Chairman PSF vowed to implement the MoU in letter and spirit. Under the MoU, PSF and TÜBİTAK will initiate Joint Research Development Projects in the areas of Natural Sciences, Energy, Earth Sciences, Engineering Sciences, Environmental Sciences and Inventions & Innovations. Exchange of individual scientists for the purpose of conducting research work, exchange of information about ongoing research activities, adaptation of new scientific methods, delivering lectures, establishing new scientific contacts for developing joint projects, attending scientific events is part of the MoU. PSF and TÜBİTAK will collaborate within the context of participation in European Union Program FP7/Horizon 2020).